Phil Tong's play dovetails the parallel tales of the original 'Typhoid Mary', Mary Mallon, an Irish immigrant to the US in the early 1900s and a group of women identified as typhoid carriers and held in isolation in London. It's a clever technique as it highlights the genuine dilemma faced by the authorities - particularly in the days before antibiotics. The central cast are outstanding, with Maddie Dempsey giving a show carrying performance as Mary Mallon that gives her a personality beyond her circumstances. Charlotte Duke as chef's wife May, Millie Chapman as young mother Florence and Elise Wilkinson as teacher Mary Brooks bring three of the London internees vividly and movingly to life. They are supported by a strong ensemble cast, although the decision to play some aspects for comic relief seems misjudged given the general tone of the piece. And while not out of place as such, and certainly well performed, the incorporation of several dance segments damages the show's pacing. Although in fairness, that's possibly my own lack of appreciation of dance in general colouring my judgement. Tong's treatment of a clearly emotive issue is sympathetic to all those involved, and while a stance is taken on society's failure of the women in later years, there's understanding shown for those responsible. With several plot elements to draw together there is a serious risk of things feeling disjointed, yet Tong's direction moves deftly from woman to woman while clearly establishing every character. City of London Freemen's School have brought a production to Edinburgh that they can be rightly proud of. 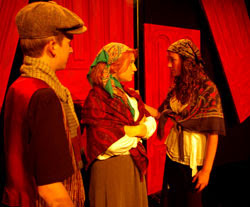 And for those of you new to View From The Stalls, please bear in mind that we maintain a policy of considering all student, youth, amateur and community theatre in the same manner as we do any professional performance - to do otherwise would be patronising to those involved. The Typhoid Marys has now completed its run at Quaker Meeting House. Image by Phil Tong used with permission.